Well, hi! Did you have a nice Christmas? Today I’ve got a fun new Simple Meal to share with you. This one is a bit different from those I’ve shared recently. You’ll be happy to learn that it includes bacon. And cream cheese. It’s like I’m giving you a late Christmas present. Best of all, this meal can be thrown together at the last minute with no prior planning! 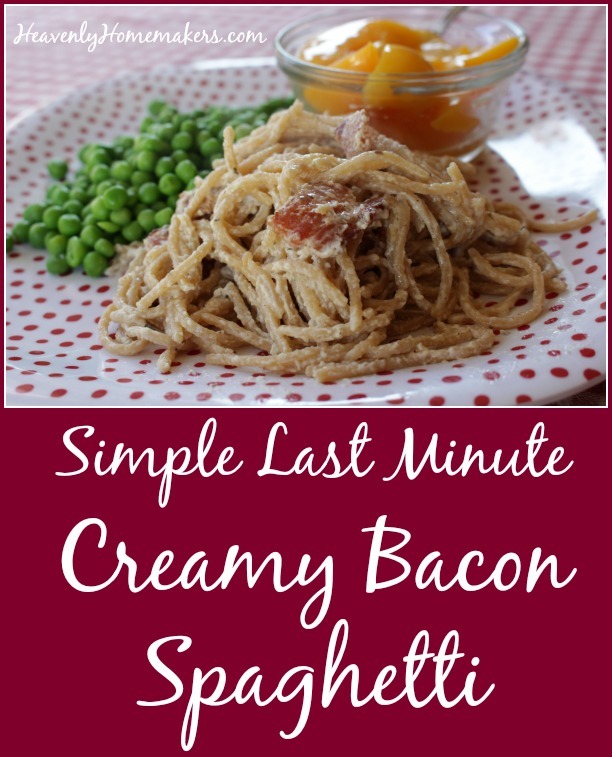 Here’s how this Creamy Bacon Spaghetti can be considered a “last minute meal” even if you didn’t thaw bacon in preparation: Bacon will thaw quickly when placed in a pan of hot water. In just a few minutes, you can cook it and stir it into your pasta. While your bacon pieces are cooking, you can boil your spaghetti. When both are finished, you stir them together with cream cheese, Italian dressing, and parmesan. A couple minutes later, your meal is served. 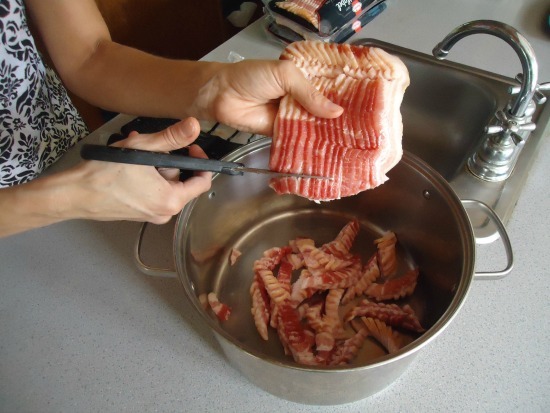 In the meantime, cook bacon in a skillet. Immediately pour hot spaghetti into the skillet with cooked bacon. Add remaining ingredients, stirring until cream cheese is melted and dish is well combined. *Here’s my Italian Dressing recipe if you like! You probably had spaghetti carbonara. 1/2 cup(about 4 strips) of rendered matchstick bacon is mixed with beaten eggs and parmasean cheese and tossed with a pound of spaghetti. 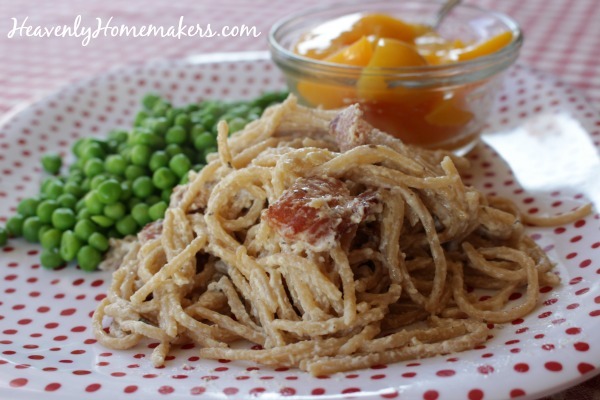 Carbonara is a family favorite, at our house, you should try it. I just printed off the recipe and can’t wait to make it – wow does it look good. Thanks. I’ve made this 3 times now, and it’s definitely a family favourite! I always double the cream cheese, because… cream cheese. Yum! So good. Thanks for another great recipe! Made this last night for a quick late night dinner for my guys. So easy, so fabulous and so delicious! This is my kind of simple recipe. I used a tub of onion and chive cream cheese as it was all I had. This will be enjoyed often on busy nights.